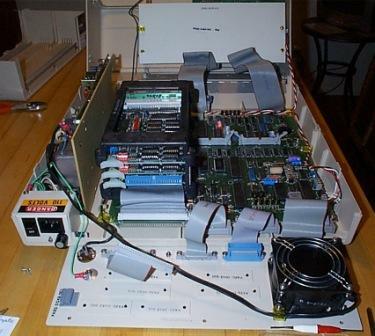 AIM 65/40 Single Board Computer. It is pretty loaded up, but does not contain the 40 character flourescent panel. It does have a TV connector and a floppy port so we assume they were used with a monitor. The ROMs include the monitor, assembler, BIOS and BASIC. Here are a few pictures. The extra box contains more RAM and a floppy controller. It has the built-in printer and a video card.